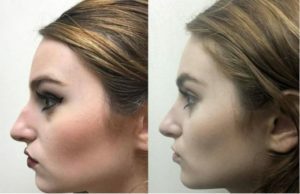 RHINOPLASTY (SURGERY OF THE NOSE) by Luis Cenedese, M.D. RHINOPLASTY (SURGERY OF THE NOSE) referred to as a “nose job” or “cosmetic nose surgery” by patients, enhances facial harmony and the proportions of your nose. It can also correct impaired breathing caused by structural defects in the nose. The nose being the most dominant feature of our faces can be significantly improved with conservative changes. Our goal is to make the changes that will improve your appearance without making them obvious. Modest changes in the nasal bridge and tip change a person’s appearance dramatically. Dr. Cenedese will change your appearance without anyone else knowing. Bumps and irregularities of the nasal bridge are typically “filed” down. Breaking of bones in rarely necessary. Small incisions placed within the nose allow resection and repositioning of the wide and projecting nasal tip. Difficulty breathing through the nose is caused by several conditions. Allergies and hay fever cause swelling of the nasal lining, therefore partially closing the airway. Oral antihistamines and nasal sprays usually temporarily correct most conditions. If these treatments are not effective, opening of the airway may be necessary by shifting the nasal septum or shrinking enlarged turbinates (nasal glands). Sinus conditions producing pressure in the face and headaches may be improved by shrinking and resection of these turbinates. Chronic stuffy nose as a result of allergies should be addressed prior to surgery by Accupuncture/Herbalist or allergy desensitization. Since some are particular about the appearance of the nose, minor revisions are sometimes required. Nasal surgery is relatively painless. Swelling prevents noticeable results prior to one week. Some patients return to work in 5 days or less. Occasional bruising lasts 10 to 12 days. It usually takes six weeks to see the majority of changes. Tapes and a small splint are worn for one week.